Every iteration of the iPhone’s mockups showed the time as 9:42. 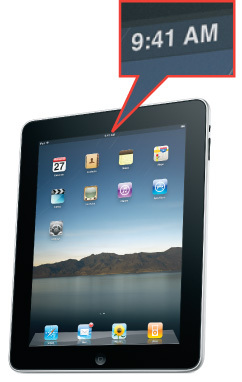 The iPad showed it as 9:41. It’s slightly peculiar–the times are grouped tightly enough to be intentional, but why those numbers? Why not 9:00? Network World investigated. Turns out Apple‘s keynote organizers think about this stuff right down to the tiniest detail–and this is certainly one of the tinier details. They rehearse the presentation with Steve Jobs, Phil Schiller, and whoever else will be speaking, and time it so the big announcement comes 40 minutes in. They add a couple minutes to be on the safe side. That means that when Apple puts that most important slide up, the one introducing the new hardware, the time on the static image of the device will be damned close to the time the packed room of journalists sees it for the first time. It’s just one more example of how carefully Apple prepares everything–that’s a detail we didn’t know about until a couple days ago, and they’ve been doing it for years, with no fanfare. Very cool, right?